Are you looking for quality at a reduced price? 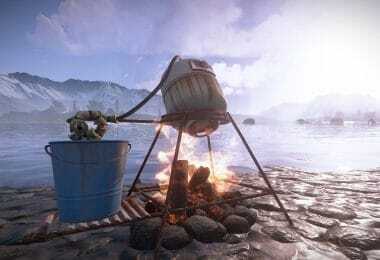 Do you think that can actually exist, particularly when we’re discussing important hunting or archery equipment? Well, the best cheap rangefinder is certainly a reality that’s waiting for you. The most difficult thing when you’re shopping for a quality product is finding one that suits your needs and also doesn’t break the bank. Besides, it’s hard to find the perfect mix, especially when it comes to finding the best cheap rangefinder. 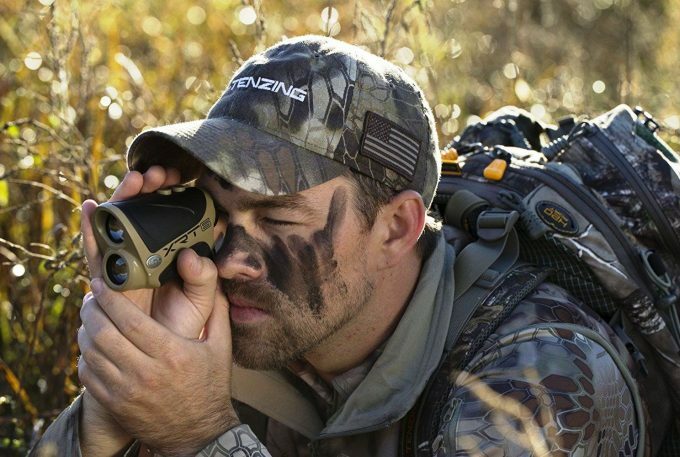 Having a reliable rangefinder will help solve most of your problems when you’re hunting or shooting at the range. At the very least, you’ll have an accurate distance measurement. But if you don’t know exactly where to seek help, you’ve come to the right place. That means we’ll help you get a rangefinder that does what it promises, even if it has a basic operation with no glamorous extras. So we’ll give you some advice on the most important things to consider, after which we’ll review the top notch affordable rangefinders we’ve found. It’s obvious that your budget is the main consideration here, but so is quality. You don’t have to sacrifice that if you go after a rangefinder that does what it should: accurately measure the distance to your target. If you want to stay in the affordable price range, you need a device that fits your purposes, so you won’t have to spend money buying another one. 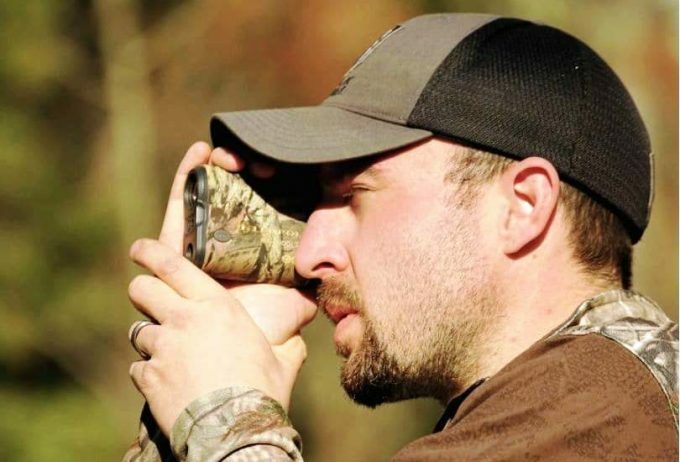 So a bow hunter should look for angle compensation modes in their rangefinders, while a rifle hunter should look for increased range and speed. You can also look for versatile items, with more modes, including a rain or fog mode for bad weather. 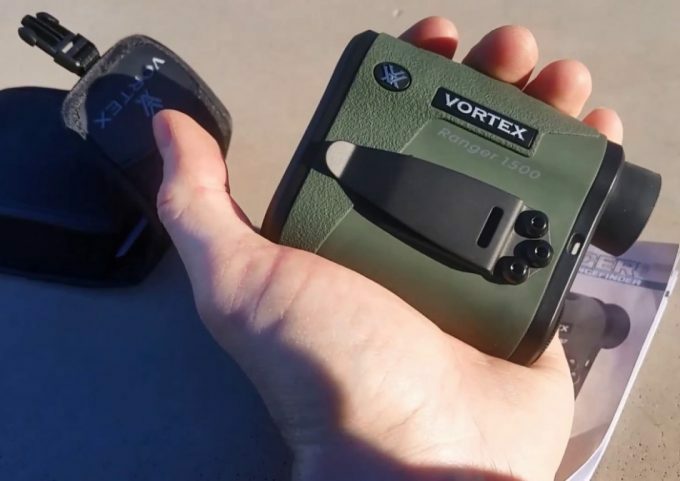 While most rangefinders have the scan mode, it’s also best to get a speed more to follow just one target. The maximum range differs in terms of your needs. It might be more important to get a long distance for rifle hunting or archery. Bow hunting or brush hunting require less distance and more magnification, particularly for smaller game. On the other hand, you also need a big magnification for target practice, so you can hit that bullseye. If you need a rangefinder for golf, the maximum range depends on other factors. Some products might work at a satisfactory distance, but not for small pins. Generally speaking, budget rangefinders have a +/-1 yard accuracy, which is great for most distances. But you need to be on the lookout for other things that regard accuracy. 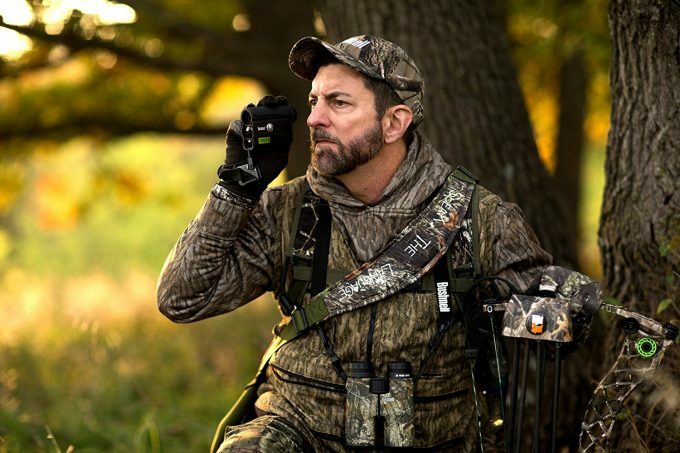 One is the ability of your device to distinguish between targets – important for golf or long-range hunting. You also need a device that doesn’t mistake trees for targets, or one that can’t read a darker target from the background – important for brush hunting. Besides, the more modes your rangefinder has, the more accurate it can be but don’t neglect the importance of an easy-to-read display. Speaking of the display, this is probably one of the most important features of your rangefinder’s construction. You have to be able to read it even in dim light, or otherwise even the most precise measurements are for nothing. Make sure you get a reliable rangefinder, that’s resistant to weather and potential shocks. A class 1 laser is another asset since this is powerful enough for accurate measurements. If you’re into bird watching or hunting that involves a lot of stalking, a tripod mount is always a perk. If you’re in the market for budget products, regardless what those might be, you should always check how complete the package is. In this case, a carry case, cleaning cloth, battery and neck strap are great. Make sure these are with good quality, though. And don’t buy a rangefinder because of the extras, these should remain just that: additional benefits, not compulsory traits. With that said, let’s move onto some of the items that are ranked among the highest quality ones today. The items you’ll see reviewed are diverse, but they’re all reliable and inexpensive. We’ve summarized all their official specifications, we’ve explained what they work for, why we like them, but we’ve also listed their negatives. 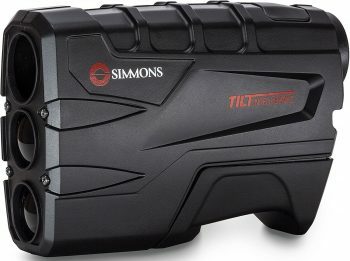 The Simmons LRF 600 Tilt Intelligence Laser Rangefinder is a solid, yet light rangefinder that functions exactly as advertised. The distance it works at is satisfactory for brush hunting, you even get a 4x magnification so you can shoot smaller game. However, between 200 and 400 yards you need to hold it very steady so it can work properly, and have a clear view. Out to 600 yards, your target should also be still. And that’s why we’re also recommending this rangefinder for golf. The LCD is clear, but it’s not lit, so you can’t read it in dim light. The one-button operation may be easy for some, but beginners have to learn the controls first. The Tilt Intelligence is great, though, since it takes the angle into account when doing the measurements. We also like the quality of the built-in class 1 < 1 mW laser, that’s powerful enough. But the 9 V required battery will drain pretty fast, so you need to stock up on them before leaving home. The carry case is a nice perk, portability-wise, so you won’t have any troubles safely carrying your rangefinder. Related: To help you practice shooting, we recommend the Caldwell Ultimate Target Stand. Featuring an oversized backer, it can hold multiple large targets. It is constructed of an all-weather moisture resistant material and it collapses to occupy much less space during transport & storage. 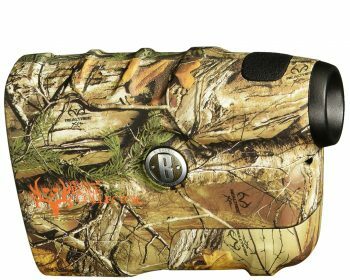 The Wildgame Innovations Halo XRT Laser Rangefinder is another reliable rangefinder for brush hunting, considering the maximum distance it can range at is 500 yards. But that is just for reflective targets, so you need to subtract 200-300 yards for deer. However, the 6x magnification is great for hunting smaller game, particularly at short distances, because you’ll see minute details. The +/-1 yard accuracy sounds really well for the price, but you will only get the scan mode. That means you need to be on a level ground for optimal results. You can use this product even in foggy conditions, since the lens are featuring anti-fog coating. The water-resistant body of this rangefinder means you can use it in inclement weather too. The main plus is that its battery will last extremely long, but the display isn’t lit here, either, which makes it difficult to read in dim light conditions. Related: Since you’ll need a CR2 3 V battery to work, we recommend getting three of them, in this Viridian CR2 3 Volt Lithium Battery pack. The advantage of the Viridian batteries is that they already last 30% more than the usual CR2 batteries, so you’ll increase the use of your rangefinder considerably. The SA Sports 7.26 Dragon Eyez Rangefinder is a very versatile rangefinder, considering it can range up to 1500 yards for reflective targets. So you can use it for hunting, archery or golf. The 7x is great for seeing minute details and shooting varmint or hitting the bullseye. A tripod mount would have been great at this point, but this rangefinder can’t be mounted on one. The 25 mm diameter is great for increased light transmission, so your rangefinder can work well at dusk or dawn too. And the corresponding 10ᵒ field of view is generous enough so you can have a large scope. Even the rain mode is great for that bad weather, and the water-resistant body helps too. The LCD display is clear, and the package is complete with a case, lanyard, and cloth. There’s no included battery, though, which is a disadvantage since that’s an energy-drainer. 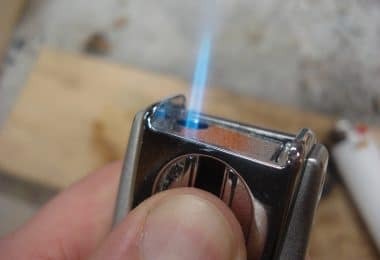 Even the battery door is a little iffy, and you’ll need to use it a lot to constantly change the batteries. Related: If you want an inexpensive, yet precise way of measuring more than just the yardage, you can always consider the Mildot Master. But with this calculator, you won’t have instantaneous readings, so it’s better for golf or target practice. 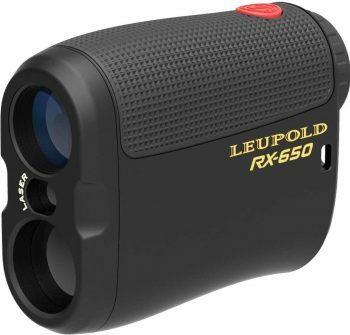 The Leupold RX-650 Micro Laser Rangefinder is great for medium-range hunting, seeing as it can give read-outs up to 650 yards. The 6x magnification is great for seeing minute details too, and you can hunt smaller game. However, it doesn’t work so well for golf where the pins are too small to see, especially if there are trees behind it. The 20 mm diameter is okay for light transmission at dusk or dawn, but the LCD display is black, so it’s hard to read the measurements. We love the big 16.3 mm eye relief that’s comfortable and makes it easy to focus, and the class 1 laser is very powerful. The 7° FOV is great for the magnification, and the hard plastic body is resistant enough. The rubber grip is comfortable, and its soft carry case is great for portability. You have to get a CR2 battery, though, which isn’t readily available in every drugstore. 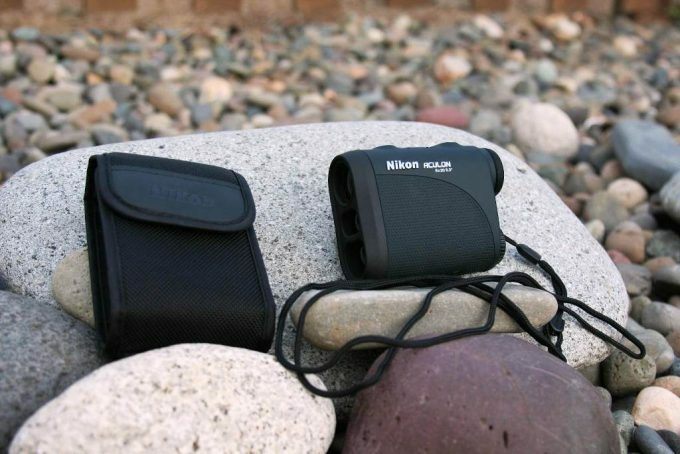 Related: Keep your rangefinder safe and by yourself when not using it, with Nikon Recon Retractable Rangefinder Tether. It is ideal for clipping on a belt loop or a backpack, and any accessory with an attachment point can be easily attached. 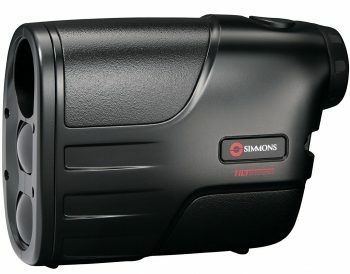 The Simmons 801600T Laser Rangefinder is a great rangefinder for bow hunting because it can be used at a 10-600 distance and it has a 4x magnification which is more than enough for this range. But the TILT function, which takes the angle into account when rendering measurements, only works to 100 yards. And that may be fine for bow hunting, but not so great if you’re using a rifle. The +/-1 yard accuracy is good, and the yards/ meters measurements show interest in user experience. The class 1 < 1 mW laser is powerful enough and saves some energy, but it doesn’t work so well with black targets. So you need some degree of reflectivity for this rangefinder to work properly. The one-button operation might feel intuitive for some, while others might complain it’s hard to get the gist of it. We do like the vertical design, though, as well as the compact construction and low weight. Related: If you’re into bow hunting, we recommend the Bowmaster Press G2 Portable Bow. This has a 6-inch jack screw which means you can use it on bows with a short axle to axle length. You can also wait for complete tear-down, which is always a perk for such a low price. 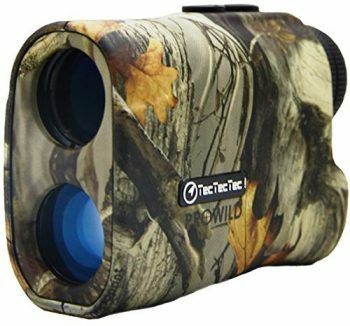 The TecTecTec ProWild Hunting Rangefinder is a bow hunting rangefinder that won’t break the bank but will prove reliable enough at 540 yards for reflective targets. The 6x means you can use it for smaller animals as well as target practice and hitting the bullseye with no problems. The 24 mm diameter works ok for dim light, but the LCD display is black so it’s hard to read when there isn’t enough light outside. This is an accurate device, but you only have a continuous scan mode, not one that will take into account the slope. It also takes more readings some time, and you have to keep it really steady. However, we love the construction. The lens is multi-coated for bright images, and the body is resistant to water and shocks. We also love the distance and battery indicators which are very reliable, and the package is complete with a bag, a cloth, a neck strap and the required CR2 battery. Related: We recommend the Duracell CR2 Ultra Lithium Photo Battery since you’ll need more than the one included battery to use this device, especially if you’re constantly on the field. 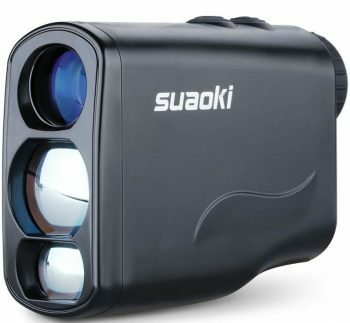 The Suaoki Digital Laser Rangefinder is the rangefinder with the most modes in our reviews. That means it’s a very versatile item, and even though we’d say its primary purpose is golf, you can safely use it for hunting too. 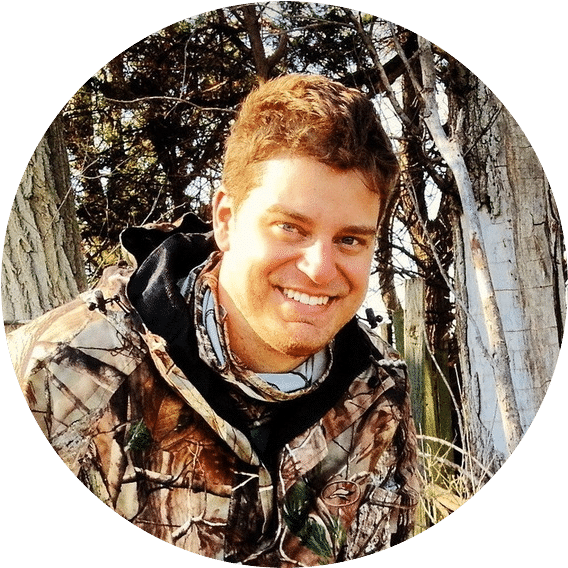 The flagpole and distance correction modes are great for golf, but the horizontal and height modes are good for hunting, especially bow hunting since you’ll get angle readings. We love the range and speed modes for rifle hunting since you can use these to follow the movements of one of your game. Plus, the fog mode makes it easy to use in inclement weather. Other than that, we love the small weight and the adjustable focus for fast shots. The 6x is great for smaller targets, and the 21 mm diameter does well in dim light conditions. However, it requires some skill to keep it perfectly steady. The 656 yards maximum range can work well for bow hunting, though this rangefinder can pick up brush as a target, so you need an open field. We do appreciate the +/- 1-meter accuracy, that’s great for such an affordable and versatile item. Related: If you’re always out golfing, you can consider the Nice Shot Golf Glove “The Bird”. Made from Cabretta leather, this is a resistant glove that will keep your hand dry and comfortable. 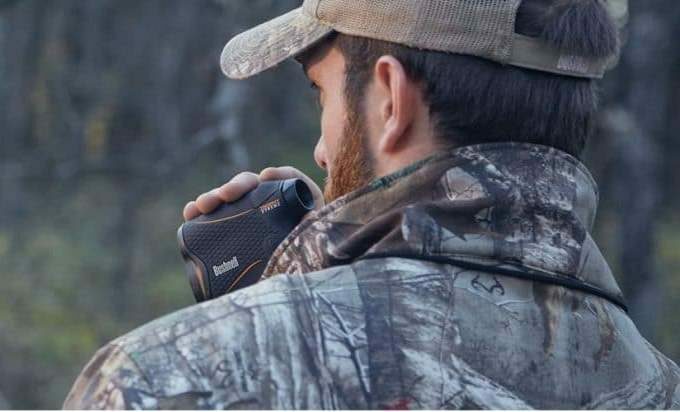 The Bushnell Bone Collector Laser Rangefinder is another one of our strong recommendations for bow hunting, seeing as it reaches 600 yards maximum range. However, that’s for reflective targets, and the actual game range is about 300 yards with a +/- 1-yard accuracy. 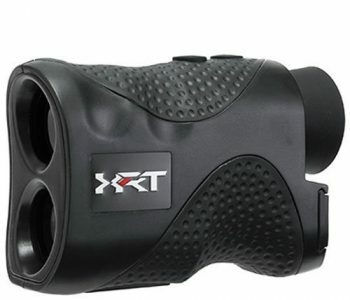 For this distance, the 4x magnification works great in picking up the smaller details, and you can even use it for golf. But you should be more careful with darker targets that can’t easily be spotted by this rangefinder. You should also be careful when using this rangefinder in a poor light since it’s not great in terms of visibility. The LCD display is clear, the vertical design looks and feels great, and the weather-resistant construction is a perk in terms of durability. We also appreciate the powerful class 1 < 1 mW laser, but the one-button operation might not be really intuitive for beginners, and the included case is tight. Taking the battery out might also prove difficult, so you need a coin or a screwdriver for that. Related: If you’re into bow hunting, we recommend the Primos Pull-Up Rope. 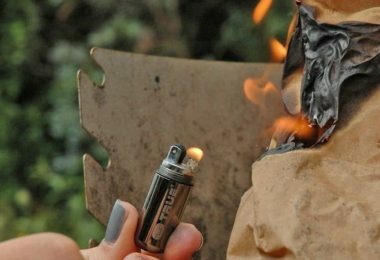 In fact, it can be used for survival needs or hiking too, since it’s very resistant and can be used no matter the weather. 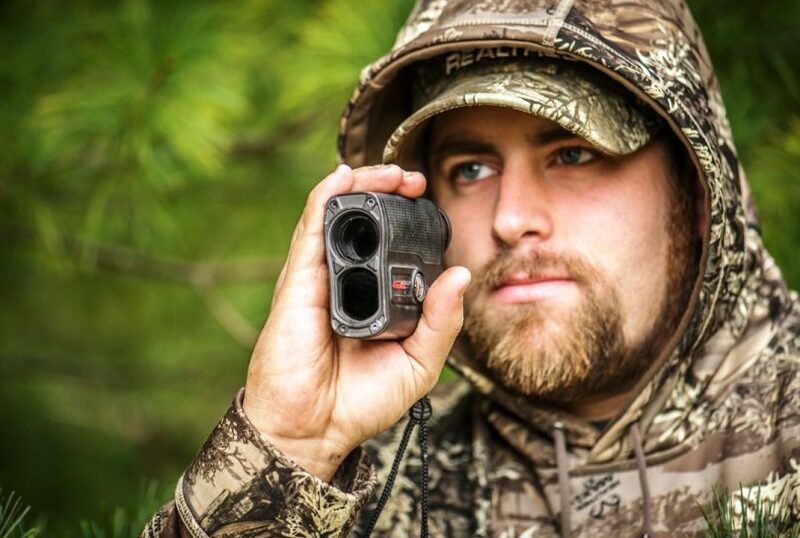 The Halo XRT6 Laser Rangefinder is a reliable rangefinder for brush hunting. With its 600 yards maximum range, it picks up non-reflective targets very close to that distance. And we love that it can also be used really well on dark targets, but it might mix targets up. The 6x magnification is great for precise details and shooting smaller game, while the +/-1 yard accuracy is an assurance of quality. On the other hand, it only has the scan mode so we wouldn’t recommend it for situations when you need to take the slope into account. It’s also a bit hard to see the readings in low light, and we all know that the best hunts usually take place at dusk or dawn. However, it is protected with a water-resistant casing, letting you use it even in bad weather. It has been designed with non-slip rubber, ensuring it won’t slip during use. The rubber also makes it comfortable to hold and protects it from bumps. Related: The ALPS OutdoorZ Trail Blazer Hunting Pack lets you safely carry your hunting equipment, featuring PE frame sheet built into the back of the pack, offering extra support and structure to the pack’s design. It also has zippered front pocket, multiple attachment points and front lashing system, so you can stay organized and bring everything you need. 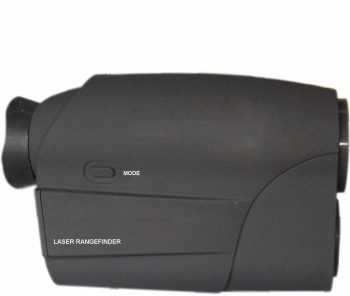 You might be in the market for a very versatile item, like the Suaoki Digital Laser Rangefinder, which has a lot of modes for different uses, or you might prefer a more basic model, like the Leupold 120464. 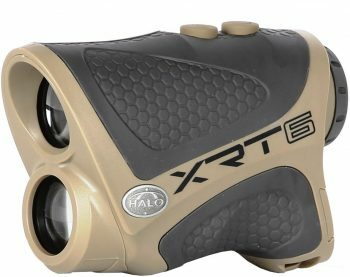 If you’re into brush hunting, the Wildgame Innovations Halo XRT is great, whereas the long range requires a rangefinder like the SA Sports 7.26 Dragon Eyez. But whichever your choice might be, we’d still like to hear about it. What are you going to use this rangefinder for? 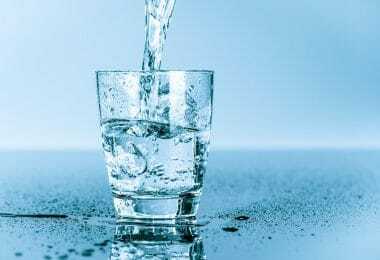 Have you tried one that’s on this list before? Leave us a comment below.